all of those new hershey kisses have been in stores near me for at least a month. oh i take it back, i didn’t notice that the dark chocolate ones were “kissables” and not kisses. I bought the candy cane and cherry cordial kisses earlier this month – I’m going to start a Hershey’s Kiss review week in a few days. They also have dark chocolate orange and dark chocolate strawberry now. I saw these along with the orange and strawberry ones about a month ago. I didn’t want to purchase a whole bag in case I didn’t care for them. I think we need to petition Hershey’s to come up with a sampler pack of all these new flavors they keep coming out with. Where can the dark chocolate with orange Kisses be found? I have been checking the stores in our area & no luck! Someone is selling on inet at $5 per bag!! Saw the advertisement for this flavor some time ago, so why advertise if they aren’t going to produce/deliver to stores? I just discovered these last month (April 2007). Our local CVS had ONE bag and I bought them… I ADORE THESE! 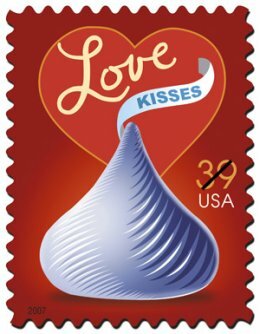 I just wrote to Hershey to see if they are still producing them and/or where to get them. If I get a response I’ll post the results.